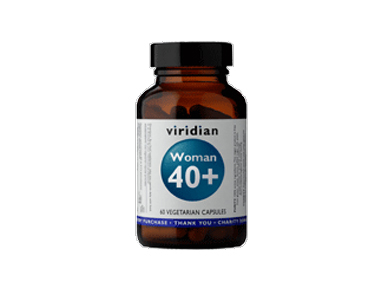 Buy Viridian Woman 40+ Multi - 60 vegetarian capsules in the UK from our online shop or directly from our independent Scottish store. More than just a multivitamin, Woman 40+ Veg Caps is a multivitamin, mineral and phytonutrient combination that blends specially formulated nutrients balancing the needs of women aged over 40. Featuring Pomegranate extract, Resveratrol from Red Grape Skin extract, Green Coffee Bean extract, balanced B-complex, chelated minerals, gentle forms of iron and vitamin C, important trace minerals and carefully selected botanicals providing appropriate phytonutrients for this age group. Take daily alongside Woman 40+ Omega Oil from Viridian Nutrition. We sell real Viridian and other Female Health directly from our shop in Scotland and online throughout the UK. Where can you buy real Woman 40+ Multi - 60 caps safely online? If you are wondering where you can buy Viridian Woman 40+ Multi - 60 vegetarian capsules safely online in the UK, then shop with us. Woman 40+ Multi - 60 caps - Viridian Woman 40+ Multi - 60 vegetarian capsules in Female Health and Herbal Remedies, Tinctures & Supplements.